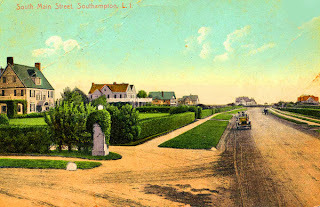 South Main Street in Southampton pictured roughly a century ago. 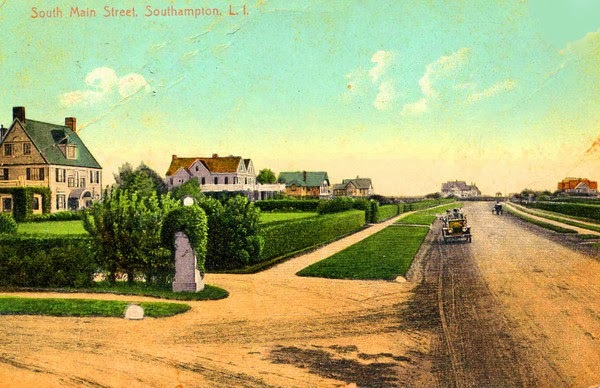 Perhaps someone with better knowledge of Southampton than I can tell us where this is precisely. It depicts the homes on the east side of South Main Street between Foster Crossing and Gin Lane. The homes remain intact. Too easy. 3rd house down on the left is the former R.H. Robertson cottage. The brick post, painted white, in the foreground is still there. I went to Google street view to see a comparison & it's all six-foot hedges & trees now. I guess plants grow & homeowners want more privacy from the street. Still, it's beautiful.